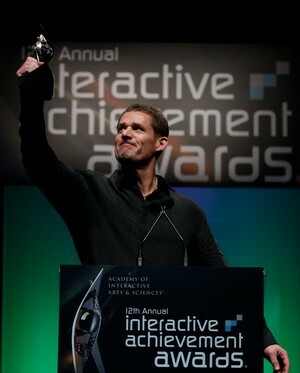 Glen Schofield is a member of the Academy of Interactive Arts and Sciences. He works for Electronic Arts. A: By making a game that people enjoy playing. When consumers and press are asking for a sequel to your last game, that feels great, that's what I work for. A: Hard to really choose because every stage has it's rewards, but probably around alpha and into the polish stage. The team is really humming and you're making tweaks every single day that make the game better and better. I absolutely enjoy that part. I love to see the game really come together. A: I'd be an artist. I was an artist first and still paint all the time. A: Bugs. Man I hate those things. Waste so much time that could be put to better use. But nothing we can do about them, just part of the job. A: Well, recently that was rebranding the Studio to Visceral Games, but now we need to solve the direct to consumer offerings: deeper more rewarding online experiences with lots of DLC. A: Not sure how recent this is, but so much of game making is hard to schedule. If you do everything to a schedule you're doomed to mediocrity. Some of our bosses and enemies, amongst other features, took 4 to 5 times as much work and time as we thought. Had we stopped when the schedule said stop, they would have sucked. What we do instead now is take some things we believe will be great to final even if they push way past the deadline. Then you just scope somewhere else. The consumers will appreciate quality over quantity any day. I think there is such an emphasis on the length of a game that you can get caught up in that. Now I'm not advocating throwing away your schedule – they are absolutely essential – I'm saying pick your battles and push to the highest quality on everything, anything else just doesn't matter. A: Absolutely. Games, whether sports, chess, board games, etc. have been around since the beginning of man. We all need entertainment, fun, a good challenge and a way to spend time either alone or together just playing games. Video games are not only important for having fun but they push technology, are an important form of art and these days part of people's social network. A: Of course! How can you know the trends, what's fun, what's not without playing the latest games and seeing what some of our brilliant colleagues at other studios are doing. We push each other without ever speaking. It's how games evolve. I think it's equally important for game execs, marketers and those that influence gamemakers to play the big games. They need reference points as well. A: Piracy and used game sales are putting a lot of people out of business. We could actually lower our retail prices if we didn't get so much of our goods resold or pirated. It's bittersweet to hear people say they loved your game but waited to buy it used. Don't get me wrong – I understand that $60 is a lot to spend, but games cost tens of millions to make and the game companies don't see a dime of used sales. We'll figure this out, though. A: Social networking and online social game playing. Many developers are already trying to embrace this and realize that the consumer is changing the way they play games and in many cases where they play them. There's still a huge market for the big triple A games that people want sit with alone and play, but the landscape is changing rapidly. Again, we just need to keep an open mind, listen to the consumer and adapt to their changing needs and lifestyles.